This new self-build property is off the mains gas grid so the owner was looking for a cost effective off-grid heating system to provide long-term lower cost energy bills. As the domestic Renewable Heat Incentive includes private self-build properties, as long as they are being built for the client’s own use, EnergyMyWay were able to recommend a heating solution which would pay for itself from the government subsidy. After consultation with the client, EnergyMyWay reviewed the benefits of an Air Source Heat Pump or a Biomass Boiler but settled on Biomass due to the size of the property, availabile storage for fuel and local availability. 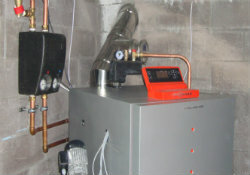 A number of different models were considered before settling on a Viessmann unit. This state-of-the-art Biomass Boiler supplies hot water and heating to underfloor and radiators via a buffer cylinder. Great news that the domestic Renewable Heat Incentive supports private self-builds, as long as they will be owner-occupied.